We at Apacheonline are currently running a fantastic Fred Perry half price sale and there are so many great deals to be had. 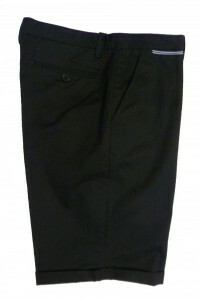 This is the S2201 Fred Perry City Chino Short and is fantastic for the recent hot weather or if you escaping to a hotter climate. In a quality cotton fabric and on trend tailored fit, team these with a pair of Toms and a Diesel vest for a great casual summer look. These were £70.00 and are now Half Price reduced to £30.00. The next selection is this lovely Long Sleeve Brushed End on End Shirt. The M1355 is a fantastic style and is ideal teamed with a skinny raw jean for a great look this season. Originally priced at £75.00 it is now available at Half Price for £37.50. The last selection is this fantastic B1058 Byron Mid Suede Boot. This is brilliant with a tapered jean for a great look this season. 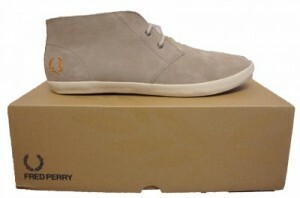 Originally priced at £80.00 these are now £40.00 in our Fred Perry Half Price Sale so dont miss out. Obviously, when Fred Perry is sold at Half Price, it doesn’t last that long. So when its gone, its gone forever so we don’t want you missing out now, do we. If you have a spare few minutes, why not check out this fantastic video detailing the iconic Fred Perry Brand. We at Apacheonline Love Fred Perry and think that their collections are getting stronger and stronger every season. 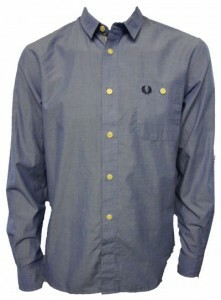 Why not take a look at all the latest Fred Perry arrivals and let us know what you think.